David Leeper in At the Flash. Photo by Sean Lambert. BOTTOM LINE: At the Flash is a veritable menagerie of queer history as told in this solo show performed wonderfully by David Leeper. The Flash is an imaginary gay bar, in some medium- to large-sized city. We’re gathered here to celebrate its grand re-opening ceremony after, presumably, a few closed years. It’s had the quite the history (as many bars like it have), starting with closeted pre-Stonewall clientele to drag queens, druggie twinks, and lesbians—oh my. Sean Chandler and David Leeper’s show, as performed by Leeper, relies only on a stool and the spot-on talent of Leeper to tell the stories of them all. 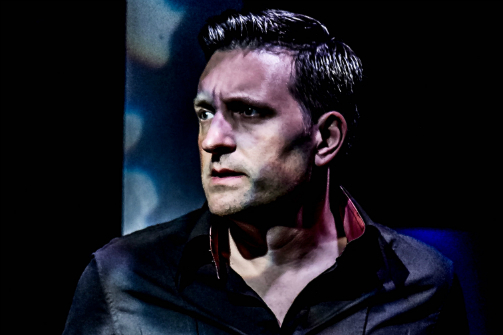 We don’t even need a costume change: Leeper’s voice and persona can change on a dime and is on exquisite display when he cycles through all the characters in quick succession during one killer of a monologue. It all shows how connected the queer and otherwise disenfranchised can feel under the roof of these bars: where, just for a moment, we can be happy. Director David Zak connects each character in simple and effective ways, where just the extending of an arm of one character can swiftly change context to a whole new motion by another character. There’s never a moment of unease in the storytelling with his careful guidance. Alexander St. John’s sound design layers the performance with dance floor music realness. At the Flash feels a little incomplete with recent developments in the timeline of gay history. We’re left with DOMA fighting lesbian Mona in the first Clinton administration. What of the last two decades? And at 29, I was one of the younger people in this crowd. I would have found it interesting to know what Chandler and Leeper have to say about the likes of marriage equality, Truvada, and Pulse. Rod, the current-day club owner, is the vehicle for this material, and he's underused here. With all the recent attention spotlighting the importance of the gay bar to the shaping of young, queer lives, At the Flash will need to adapt to keep up. If some, especially those familiar with plays about gay history, might find the script a bit lacking, David Leeper’s performance helps make up for this, and might well be a stand-out of Fringe. See it, and then have yourself a drink at the nearest gay bar to celebrate. At The Flash is by Sean Chandler and David Leeper, and performed by David Leeper. Directed by David Zak. Lighting Design is by Jennifer Davison. Sound Design is by Alexander St. John.